Used Rolex watches are kind of like cars. You can spend almost any amount on them, and some cars either appreciate or depreciate based on their rarity and popularity. People who buy lots of cars rarely buy brand new. After all, we have heard many stories of someone buying a luxury car brand new, only to lose ten thousand dollars in value just driving it off the lot. Smart car buyers know to buy cars at market value. The same goes for a used Rolex. It can be somewhat shocking to go to a retail jewelry store and see the prices on a new Rolex. Not to mention the intimidation factor can be quite real when dealing with pushy sales people, practically shoving past each other to try to earn their commission. That commission also makes it difficult to negotiate for a better price. After all, there are plenty of people willing to pay full price, so why should they discount it for you? Make sure you purchase from reputable sellers. It used to be so easy to tell the difference between a fake Rolex and an authentic one. However, as manufacturing becomes ever more precise and automation more prevalent, more and more excellent fakes are flooding the market. 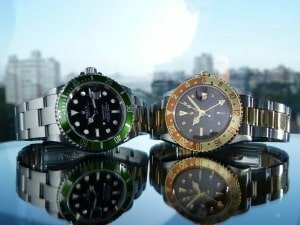 While there are many websites dedicated to spotting fakes, the only true protection you can have is to buy your watches from a reputable merchant. Do your research. Check their Yelp reviews, you can guarantee if someone sold a fake, chances are that person will write a 1-star and explain why! You can also seek out a business’s reputation in other ways. Are they a member of the Better Business Bureau? Does this merchant have an eBay store? What is their rating on eBay? How long have they been in business? Do they offer a warranty? These are important questions, and ones that can arm you properly against being swindled when searching for your used Rolex. The Price: First off, you should always keep the old adage in mind: If it seems too good to be true, it probably is. If someone is offering a six thousand dollar watch for six hundred, the alarm bells should be ringing in your head. While it is possible that a private seller may not know what they have in terms of value, in the information age we live in, that is highly unlikely. It is even less likely that a dealer doesn’t know what they have. The Ticking: Rolex watches typically don’t “tick” in the conventional sense. As they utilize high quality mechanical movements, Rolex automatic watches tend to “sweep” or look like smooth motion unless you look up real close. If you see a Rolex “ticking” like a quartz watch, chances are it isn’t real. Weight: Many fakes can look really close to an authentic piece, but in many cases, as they use cheap metals and other materials, the weight will be way off. Pay attention to how dense it feels in the hand. Serial Numbers: In many cases, fake watches may have serial numbers on them, but the quality of the engraving is usually quite shoddy. If a watch has serial and reference numbers that look, well, off, it can be an easy tell. Many a used Rolex can include the original box and papers. This provides a point of comparison to allow you to look up the numbers and authenticate the piece.